The Glass Menagerie, as directed by Manaal Mahjoub, beautifully and tragically tells a story of the truths and tribulations of reality. 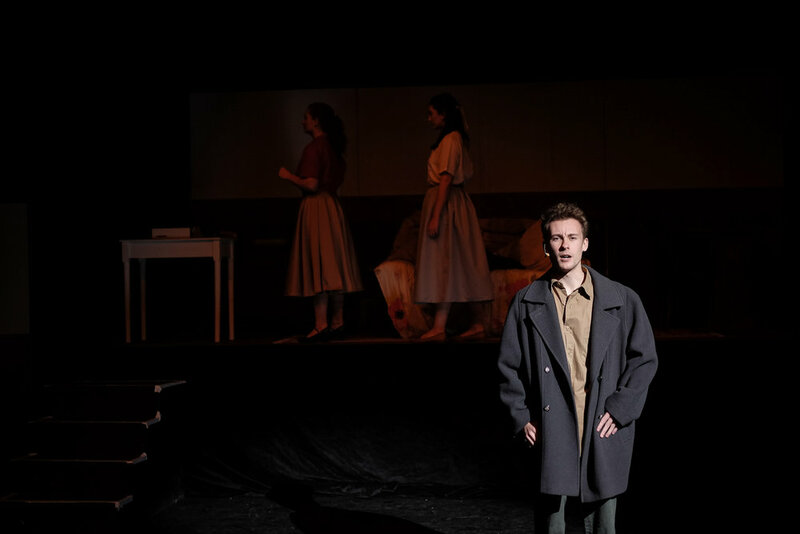 Upon the play’s beginning, the audience is greeted by Tom Wingfield (played by Morgan Corby) whose narration sets a comfortable, dreamlike blanket over the scene. Lit only by a single spotlight upon the backdrop of a blue curtain, we are told this is a ‘memory play’ reconstructed from his own mind. It is notable to mention the bittersweet piano flourishing the opening monologue (provided by Josh Wood’s accompaniment) which truly brings the opening scene to life, and adds a wash of nostalgic emotion to the play as a whole. As the curtain finally rises, we are greeted by the rest of the Wingfields—Tom’s Mother Amanda (played by Molly Williams) and his sister Laura (played by Eleanor Burke). The Glass Menagerie follows the family’s struggles economically and socially—Laura’s struggle with her disability and crippling shyness foiling Amanda’s melodramatic inability to stop living in the past and accept the reality in which she now exists. The raised, two-dimentional set (technical design by Grace Cowie) creates a stage within a stage of sorts, not only reinforcing the cramped nature of the Wingfield’s abode (and by extension, their financial situation), but also a further reminder that we—the audience—are being told Tom’s story; it is not a realistic piece. The first act introduces us to the mundane: Tom’s daily struggle with hating his job and desire for the life of an artist, Laura’s unsuccessful attempts to enroll in business school and Amanda’s hopeless yearning for the past and romantic success. The second act of the play is when the actors, the set, and the script itself really shine. Burke’s Laura is both pitiable and endearing, arousing true sympathy from the audience as the story progresses, her earnest in interaction with the smooth-talking, too-good-to-be-true Jim O’Connor (played by Xavier Atkins) truly garnering audience support for her and her endeavors. The heated clashes between Williams’ Amanda and Corby’s Tom evoked great emotion from both sides, creating hard-hitting emotionally charged moments which stuck with me long after the final curtain fell. The set’s subtle transformation as the play progresses is also worth noting—the Wingfield residence going from a banal apartment to a dreamlike, surreal setting, with Grace Cowie’s depiction of the titular menagerie itself through an assortment of origami animals strung in rows above the stage both creative and visually stunning, striking the audience upon the genesis of the second act. Through the subtle tragedy of the play, moments of pathos are frequently achieved through the cast’s on-beat comedic timing—a special mention going to Williams’ Amanda, whose theatrics never failed to elicit a chuckle from the audience. Rarely have I seen an audience so engrossed in a play, remaining eagerly silent, laughing or even audibly gasping at a certain notable revelation nearing the climax of the piece. The simple, yet heartbreaking ending of the play truly leaves the audience in thought as we are left to consider the consequences of the characters’ actions on our own once the actors have taken their bows.